New to our designer lighting website is track lighting. Versatile and modern, contemporary track lighting fixtures are the ideal solution for retail and home designer lighting needs. With pendant track lights, you get the flexibility you require. Here you will find halogen track lighting, kitchen track lighting, and pendant track lighting, plus low voltage track lighting systems, as well as all of the necessary accessories required to make your affordabble track lighting fixtures totally operational. This is the place for contemporary track lighting systems. For more flexibility, look through the monorail lighting section. Track Lighting is a growing new trend in architectural lighting. These track lighting systems fit well with any contemporary lighting layout in your home or office, as well as gallery or retail space, and are extremely versatile in their placement, installation, construction, and function. Modern track lights feature spot and pendant lighting head fixtures so that you can adjust the concentration and direction of light around what areas matter most in your home. Perfect for highlighting spaces where friends gather, say couches or dining room tables, or just spots that need a little attention, like wall art and kitchen islands, contemporary track lighting is a fabulous solution to brightening things up a bit. 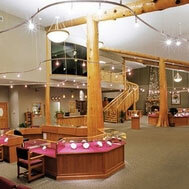 In terms of design, track lighting systems are extremely flexible when it comes to home decor. You can install very simple kitchen track lighting and pendant track lighting with only three or four sources of light and you can choose finishes and fixtures that blend in with more classic rustic or traditional lighting styles. Or alternatively, you can make pendant track lights the centerpiece of your ceiling and showcase your leanings towards more modern, industrial design, choosing sleek metallic finishes like copper, chrome, stainless steel, titanium, or stark black or white. There are many creative track lighting options for sale and it’s all up to you. Architectural pendant track lighting has become the latest fashion in home and high end lighting design but modern lighting also requires a sense of play, adventure, and comfort. Leading brands of contemporary track lighting fixtures include Bruck Lighting and Tech Lighting, among many other types of track pendant lighting. Both of these very prestigious and reputable track pendant lighting manufacturers are well educated when it comes to the latest technology in green homes and both employ industrious and skilled artisans to develop the next brilliant track lighting system masterpiece. When you buy from Affordable Lamps, you won’t be disappointed. While ceiling lights and wall lighting fixtures certainly have their place in keeping your home looking crisp and bright, nothing can compare with the control and ease of use that track lighting systems allow for. And most modern pendant track lights are also designed to be extremely energy efficient, so you can illuminate your home without raising your electric bill. Consider installing the best low voltage track lighting, LED lights, or fluorescent or halogen track lighting to give your space a boost of light and still respect the environment in style. Any of these pendant track lights will last much longer than the out-of-date incandescent bulbs and are well worth the investment in your home’s lighting design. Inexpensive Modern track lighting provides unyielding creativity in the placement of lights and illuminating an area, including pointing light fixtures in different directions and varying the luminance from subtle to dramatic. This allows you to create focal points in a room and develop a sophisticated ambiance using your contemporary track lighting. Pendant track lighting systems are extremely adaptable and versatile as you can vary the lamps along the track or even change them for a new look or seasonality. You can change the colors or textures of the track pendant lighting to match the seasons (and your wardrobe), for instance during the winter months, you may choose the darker colors and during the summer months, brighter colors may be more suitable. Modern track lighting comes in two styles, a rigid track and monorail. A monorail track gives greater flexibility in the drop of the light fixture from the ceiling and its form. Though, standard pendant track lighting is useful for running lights vertically along walls. Tracks are ideally made to have numerous lamp heads. Discount pendant track lights are typically used in modern decor. The electrical wiring of most modern track lighting is hidden inside a plastic or metal track. Some tracks, such as the T-Trak Straight Track by Tech Lighting, Enzis 3 Light Monorail Track, and Enzis 5 Light Monorail Track by Bruck, are very flexible as they are hand malleable giving you unlimited creativity in creating a form for the hanging lamps. This makes it very useful for problematic areas where traditional lighting is not up to par. Sometimes essential for industrial applications where unique forms are necessary for custom built designs and layouts or changed to accommodate different displays. Because of its very nature it is commonly used to isolate work and social areas or bring focus to fine art or other design elements. 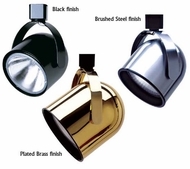 Modern track lights are unobtrusive and pleasant as compared to traditional spotlights. Track lighting systems are wired directly to a line voltage of 120 volts, common in standard homes, or a low-voltage transformer to step down the 120 volts to 12 volts. Low voltage track fixtures are energy efficient as they use less power than the line voltage counterparts. It is a very important point to consider when choosing between modern track lighting systems as placing a low voltage bulb in a fixture that is wired to a standard line voltage is a dangerous hazard. The good news is modern track lighting is easy to install.